New Rochelle, NY, September 4, 2018–A new study has demonstrated the tissue regenerative potential of a chemoattractant delivery system that can draw mesenchymal stem cells (MSCs) to the site of intervertebral disc (IVD) degeneration. The study, carried out in a cow model of IVD degeneration, not only showed the recruitment of regenerative cells, but also reported increased collagen production, as described in an article published in , peer-reviewed journal from Mary Ann Liebert, Inc., publishers. Click here to read the article free on the Tissue Engineering website until October 4, 2018. 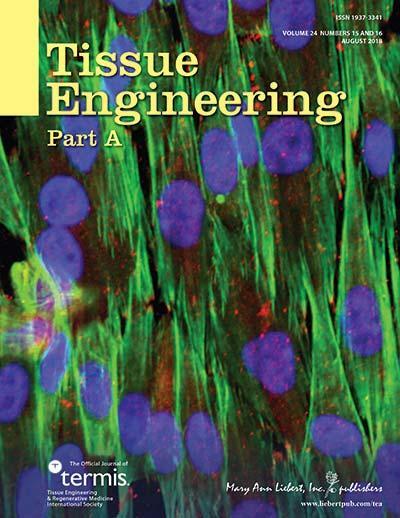 Tissue Engineering, Part A is an authoritative peer-reviewed journal published monthly online and in print in three parts: Part A, the flagship journal published 24 times per year; Part B: Reviews, published bimonthly, and Part C: Methods, published 12 times per year. Led by Co-Editors-in-Chief Antonios G. Mikos, PhD, Louis Calder Professor at Rice University, Houston, TX, and John P. Fisher, PhD, Fischell Family Distinguished Professor & Department Chair, and Director of the NIH Center for Engineering Complex Tissues at the University of Maryland, the Journal brings together scientific and medical experts in the fields of biomedical engineering, material science, molecular and cellular biology, and genetic engineering. Leadership of Tissue Engineering Parts B (Reviews) and Part C (Methods) is provided by Katja Schenke-Layland, PhD, Eberhard Karls University, Tübingen and John A. Jansen, DDS, PhD, Radboud University, respectively. Tissue Engineering is the official journal of the Tissue Engineering & Regenerative Medicine International Society (TERMIS). Complete tables of content and a sample issue may be viewed on the Tissue Engineering website.